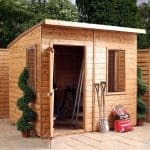 The Hartwood 10′ x 8′ FSC Standard Workshop is the ideal place for you to have some fun, relax and work on projects that you cannot do in the house or in the garden. 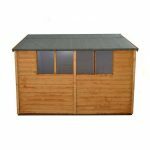 It is a good sized workshop that has plenty of space so even if you were to use this as a general storage shed you would have plenty of room. Anything you place in here is going to get inside the workshop easily as the doors are wide and high. These doors can also lock thanks to the included rim lock and key so it also offers you an immense amount of security. 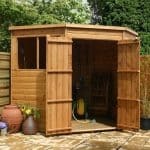 While this is one very practical workshop it is also a very attractive looking structure that you are going to love having in your garden. While the workshop is a good size and fantastic looking it is also very well made. 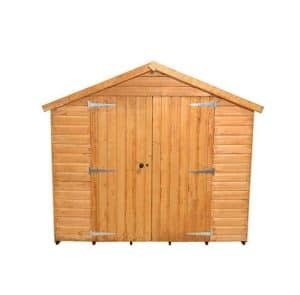 This starts with the gorgeous tongue and groove shiplap cladding which is attached to a thick and strong frame which makes the whole workshop have a very sturdy and high quality feel to it. With tongue and groove boarding used for both the roof and the floor. This is a workshop where from the top all the way to the bottom it is made with high quality materials. The Hartwood 10′ x 8′ FSC Standard Workshop may have standard in its name, but this is one very high quality workshop. 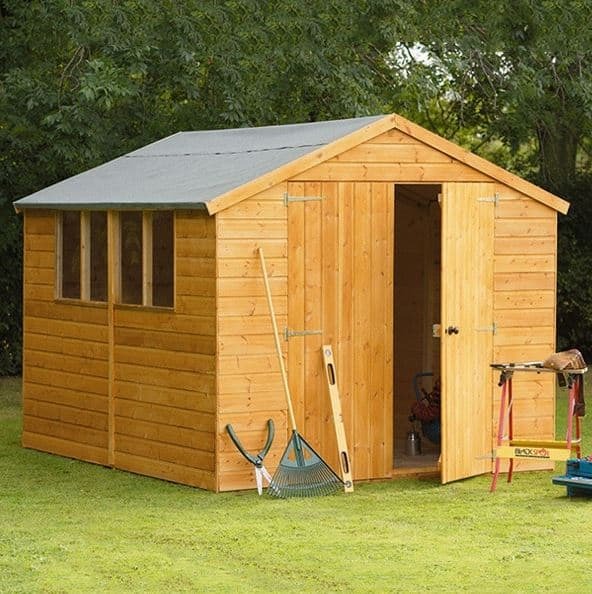 This has that classic shed/workshop type look to it and we really like it. Anytime we see something that has a rather old school vibe it makes us very happy. 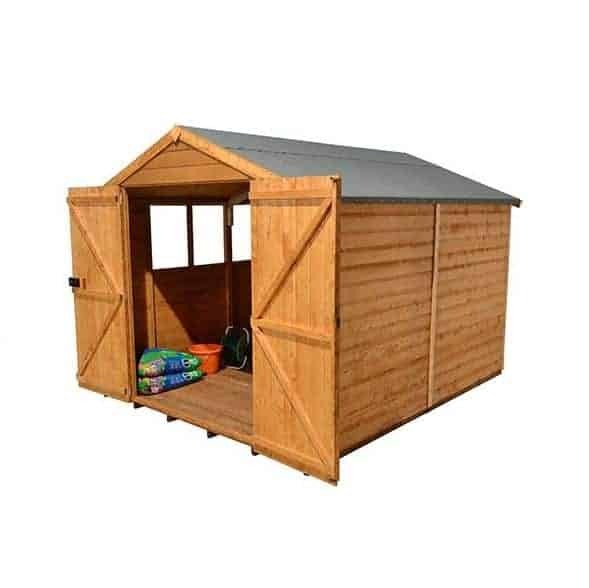 This is a very good size as it offers you plenty of storage space, but at the same time it is not so huge that you would need a garden the size of Old Trafford to fit this in. It is 8 feet 7 inches wide and a very impressive 10 feet 3 inches deep. This gives you a lot of room to have things like workbenches and other such items that you need to have some fun working on projects. 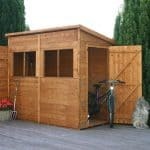 The size of the workshop also makes it perfect for general storage so the kids bikes, your mower and other tools will have a safe and out the way place to call home. They have made sure that the height of the workshop is ideal for even the tallest of people as along the ridge it is 7 feet 7 inches high. 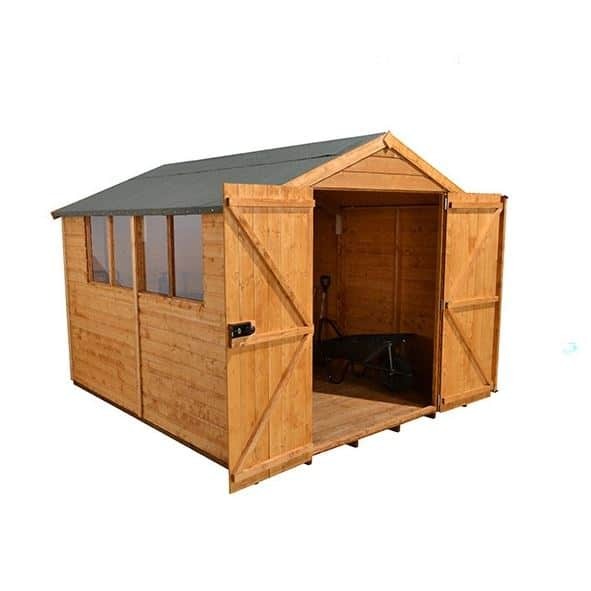 We are firm believers in a workshop or even a shed of this size must have an apex roof so we are pleased to see that the designers of this feel the same. Made with solid tongue and groove boarding and covered with, green mineral felt as well as being a roof that has a great look to it, it is also very strong and resistant to anything the weather can throw at it. 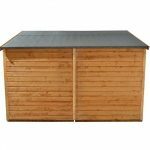 The 12 mm thick tongue and groove shiplap cladding has a silky smooth look to it and with the way the cladding is made, you will certainly have no worries at all about rain getting in through the cladding as there are no little cracks or anything like that. It is so easy to just focus and talk about how nice looking this cladding is, but we must tell you this is some of the strongest and well made cladding that we have seen. We are very impressed with the 45 mm x 28 mm frame that they have used and the way that it is connected so well to the cladding. This sets the tone for what is one very strong and long lasting workshop. The cladding is good and thick so even 20 years down the line, you will not have worries about the workshop becoming weak. When you look at the pictures you can see the fantastic tongue and groove floor that they have used. This is just like what is used for the roof and this along with those good sized floor joists mean that even your heavier items will cause no problems for this floor. The timber will be given a basecoat treatment before it is sent to you and this will look after the workshop while it is being sent to you and even during the first week or two of its life. 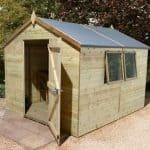 We do highly recommend that you coat the workshop with wood treatment within a week or two so that it is protected from rot as soon as possible. Once a year, you will need to give the workshop a fresh coating to make sure that it stays rot free. As long as you do treat the workshop regularly and look after it properly then you will have a 10 year guarantee watching your back. This is a fair guarantee, but make sure you do treat the workshop as you may not be covered if rot does start to rear its ugly head. The Hartwood 10′ x 8′ FSC Standard Workshop has a set of double doors which as you can see from the pictures will make getting even the largest item inside here no problem. Each door has three silver coloured heavy duty hinges and two ‘z’ braces to make sure it is extra strong and to also prevent it sagging a few years down the road. There are four 1.2 mm thick anti shatter styrene windows on one side of the workshop. Natural light will be able to get into the workshop through these and we do like the size of them, but we must say it would have be great if they had made it so one or two of them could be opened. No matter what kind of tools, bikes or time travelling device you may have in the workshop, it will be well protected thanks to there be a rim lock on the doors. This is a fantastic bonus and one that is going to make sure your belongings are safe. Despite having four windows on one side of the workshop it is actually still offering a decent level of privacy. You could always add something like a set of blinds if you want to make sure that no one can see what you are keeping in here. But for most people we are sure that these windows are not going to cause you any concerns. As the workshop requires treatment, you can use this as an excuse to change the colour of the workshop. Long gone are the days when you had to choose between light brown and dark brown wood treatment. These days they have it in all kinds of colours so no matter how bright you want to go, we are sure that there will be a wood treatment for you. 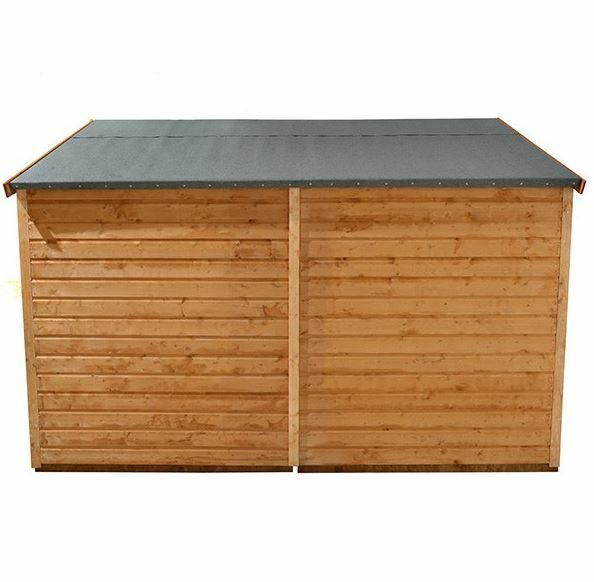 For, £199.99 you can add a 10′ x 8′ Ecobase Plastic Shed Base which is made for those of you who are not too confident in the ground you are installing the workshop on. If the awesome rim lock is not enough security for you then they do have a couple security upgrades for you. First of all is a Yale Hasp Steel Black Finish 120 mm & Brass 40 mm Padlock which we feel is being sold at a fair price of £19.99. 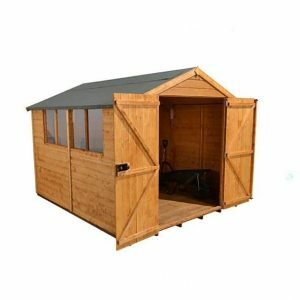 If even that is not enough security for you, then you may be interested in the Yale Super Durable Deluxe Shed Alarm Security Kit, which can be added for £29.99. This is one very impressive workshop. It gives a very strong first impression, but when you take a closer look, you see just how well this is made. The materials are fantastic and they are going to last for a very long time and as long as you treat the timber with wood treatment, you will not have any issues with rot. 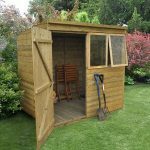 10 x 8 is a very good size for a workshop as it offers you a very decent amount of space to make use of, but it does not need a monster sized garden to call home. We see this as a very straightforward DIY job for the most part. As long as the person you get to help you out can hold a hammer, you are not going to have any issues putting this together. While this is one of the more expensive 10 x 8 workshops we have seen. It is actually still very good value for money as it has been made using some very high quality and top of the line materials. 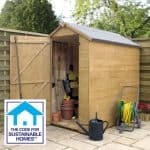 Final Thoughts: The Hartwood 10' x 8' FSC Standard Workshop is certainly one very smart looking and high quality workshop. They could have actually had this as part of their premium line and we would have been fine with that as they really have used some of the best materials to make this workshop. The price tag may raise a few eyebrows, but we must say that the price is reflected in the high quality materials that they have used. We know that you can get a workshop of a similar size for less money, but we can assure you the quality will not be as good as this. So maybe have a think about saving for a month or two more before you rush and buy a cheaper workshop.